This is the view of Lion Hill in the Sheeprock Range as seen from North Oak Brush Canyon. 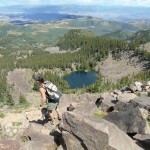 The Sheeprock Mountains offer the hiker a variety of surprises not easily seen from the valley floor. 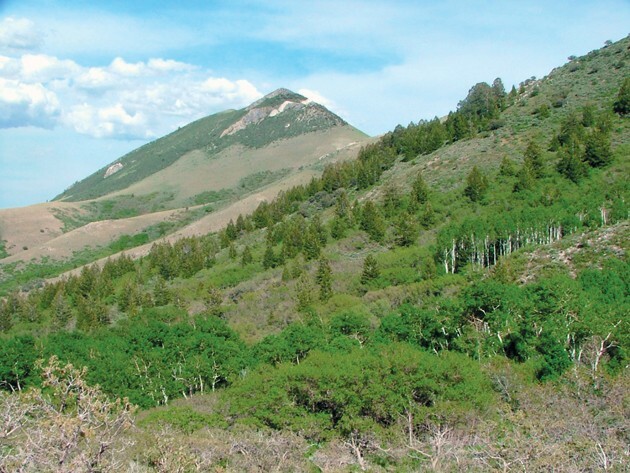 Tucked away in the southeast corner of Tooele County is a compact range of mountains that are seldom visited by anyone other than ranchers and private property owners who live around this area. I‘m sure they would like to keep it that way, but because a large portion of the Sheeprock Mountains is part of the Wasatch-Cache National Forest, the public does have good access via a few different starting points. Even though the range looks mostly barren from the valley, there are several little canyons that conceal surprises for the outdoor adventurer who makes the effort to visit them. The Sheeprocks measure approximately 20 miles from east to west and are oriented in a sort of “L” shape, starting with 8,516-foot-high Red Pine Mountain in the north near Lookout Pass, and trending south to the highest point 9,274- foot-high Black Crook Peak. From Black Crook Peak the backbone of the range trends sharply east in a sort of right angle over to the vicinity of Lofgreen near SR-36. This east trending ridge forms the backdrop for the town of Vernon and it averages an elevation of right around 8,500 feet for most of its length. 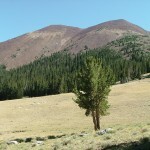 Some notable high points in that section of the mountains are un-named peak 9,020 feet above Harkers Canyon and 8,964-foot-high Dutch Peak further east along the same ridge. 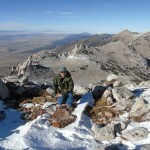 The Sheeprocks are located near the eastern border of the Great Basin but other than some of their east-west orientation, the Sheeprocks are a typical Great Basin range. The Great Basin is described by the National Park Service as being a 200,000 square-mile area where water drains internally into sinks, salt lakes or simply evaporates. It is a harsh desert environment where there is little rain, hot summers and cold winters with abundant snow. The Great Basin’s aridity is caused by the rain shadow effect produced by the Sierra Nevada and Cascade Ranges in California, Oregon and Washington. 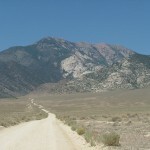 The Sheeprocks, like many other ranges in the Great Basin, rise up from the desolation of the desert to high elevations. As you climb them, climate, vegetation and animal populations change. Sometimes geology plays a significant part in determining what trees grow on a certain range just as available moisture does. This must be the case with the Sheeprocks, because though they are high enough to support mixed fir forest, there is little fir or pine to be found. Like many other Great Basin ranges, water is the life blood for everything in the Sheeprocks, of which there is a fair amount. Most of the main canyons in the range have a tiny spring-fed trickle or stream of water in them. The courses of these tiny streams are lined with dense communities of aspen. When viewed from above, they look like aspen rivers confined to the canyon and branch canyon bottoms. There are some cottonwood, bushes and water loving plants mixed in with the aspens and a walk there can be enjoyable at the right time of year and time of day. In the vicinity of North Oak Brush Canyon and North Pine Canyon, there is a thriving dense forest of Gambel Oak that provides browse and cover for a healthy mule deer population. Pronghorn Antelope patrol the benchlands and flat areas of Rush Valley and the Sevier Valley at the foot of the Sheeprocks. The northern part of the range is covered by a dense band of juniper woodlands where you will likely encounter jack rabbits and mule deer. While fir trees are rare here, they do occur, thickly in some places. One is Red Pine Mountain. This peak is unique as it rises conically to an impressive elevation. Its west face in the vicinity of Log Canyon is characterized by large bands of limestone cliffs that have thick stands of fir beneath the cliffs. At the base of the cliffs there are large, old bleached logs and broken rocks and scraggly trees fighting to survive, the branches of which would make a perfect perch for a mountain lion. The best forest on the range is found in North Oak Brush Canyon. Again, you would never suspect from the valley the concealed treasure in this canyon, but once you’re there, the beauty and sanctuary of the place is incredible. Ancient mining roads climb up to high elevations in this range and may be difficult to find in the summertime due to dense undergrowth. A good landmark in this canyon is a rocky knob set right in the middle of it. This large 60-foot-high rock is known as the “Sheeprock.” Some old articles in the Salt Lake Mining Review referred to this rock as the source of the mountain range’s name. Another article claimed that the name is derived from the Desert Bighorn Sheep that live in these mountains. Whether or not the Sheeprock is the source of the name, it is a fascinating place. It is set beautifully in the center of a relic pocket alpine forest that has survived from another epoch. In next week’s article, I will continue the description of this beautiful little range, compare and contrast some of the different localities and provide some outdoor adventure options for the curious explorer.